The summers here feel like a giant waterslide. We jump on in early June and splash at the bottom in August. It is fun no doubt, but one big blur as the summer flies by. The boys have a busy summer the weeks they are here, with only one week maybe free just before they return to school. The first week on the waterslide, the boys had soccer camp and my mom came and visited. Will patiently waiting to board his flight to St. Louis. 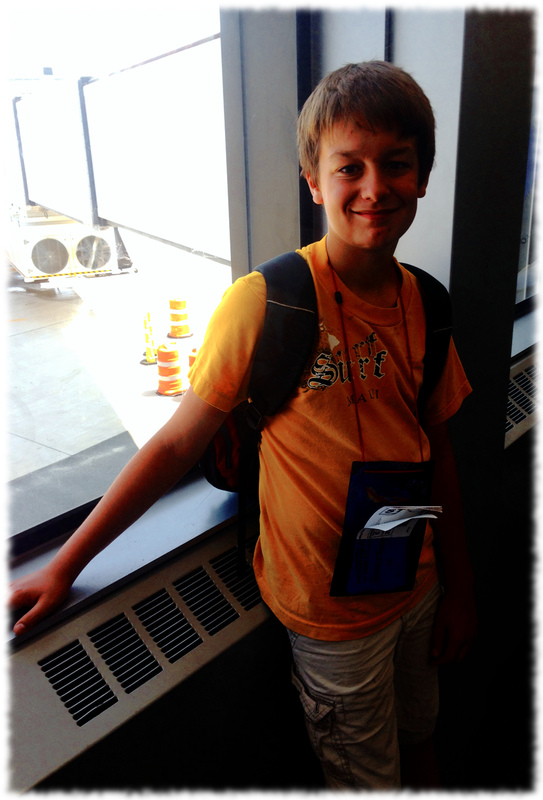 This week sends Will on a solo adventure to St. Louis to spend a week with my dad. I drove him to Boston this morning and watched him board a Southwest Airlines flight. It brings mixed emotions – I love that he is having an adventure; but it is also sad to see him starting to grow wings and fly farther from the nest. I think he was more nervous than he wanted to admit. Of course, I probably was as well. Now he is there, he has a fun week planned. He will get to see his cousins that he hasn’t seen in two years, maybe visit Six Flags and the City Museum, spend a night camping on a river, and maybe a bike ride if time can be found. Ben is at Project Oceanology this week. He gets to spend the week out on Long Island Sound exploring the world living in the coastal waters. He also gets a whole week without his big brother bothering him at home. I think it is exciting for him to get a chance to a camp by himself, and not be overshadowed by his brother. Today he went to Pine Island and seined for fish along the shore, catching fluke and flounder. We have one day off this weekend, Sunday. I think a day resting will be needed (though who knows, maybe a short trip to the North Lake beach will be fun). When the boys return in August my brother, his kids, and my dad will visit for 8 days. Finally, in late August, we will have a week without any camps or visitors planned. The boys have asked for a day to just take it easy and play video games. I’m inclined to give it to them. We may also take the sailboat out for an overnight camp to Long Island – I’ll have to see how the weather is that week. And after that we splash down into the next school year. It wasn’t sunny or windy. But it wasn’t rainy or cold. So it was a perfect day to take the boat down the Niantic River and out into the Long Island Sound, raise the sails, decide there wasn’t any wind, lower the sails, catch a right and motor over towards Rocky Neck State Park. Which is what we did. 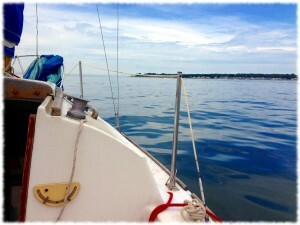 We anchored for a little while not too far from Griswold Island next to Long Ledge. 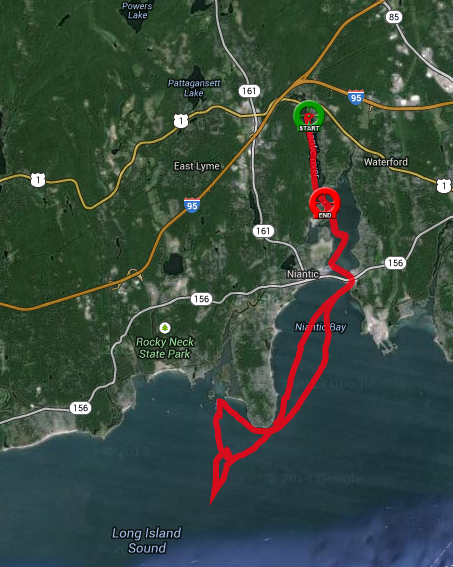 Susanna decided to test out the cold waters of Long Island Sound for a very short swim. I didn’t bring my bathing suit, but I still jumped in. And it was cold. The wind picked up after lunch and I again raised the sails. However it was a light wind and with the current in LIS heading west we were not making any progress towards home. I started the outboard and we motored home. Overall we covered 15 miles in about 4 hours and 30 minutes. Blueberries fresh from the garden. It is blueberry season. We have six blueberry bushes (2 each of 3 different varieties), but have typically only gotten a significant number of berries from two of the plans. It is looking like we will get berries from all six this summer, though only two of the bushes have ripe berries this early. 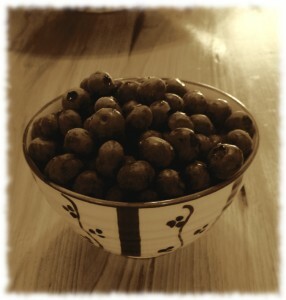 Fresh blueberries for breakfast today. The 4th of July (or “Colonial Insubordination Day” as my friends in the Royal Navy like to call it) calls for hot weather, barbecue, beer and fireworks. However, this year, thanks to Hurricane Arthur, we get cold and rain, though as I write this, it sounds like someone is trying fireworks in the distance. Not sure what there is to see in the rain tonight. And don’t worry; even cold, rainy nights can support beer. Today I got an escape from my chores to spend the day in the workshop. I’m building outdoor toy boxes for Susanna’s preschool. Three boxes from 10 sheets of plywood, so I have lots of left over plywood scraps and decided to build a small (16″ wide x 12″ deep) storage shelf for the office. It is also a good chance to test out the finish that I plan for the toy boxes. The shelf was a quick, taking less than a day in the middle of another (larger) project and was a good reminder to prep surfaces as much as possible prior to assembly. 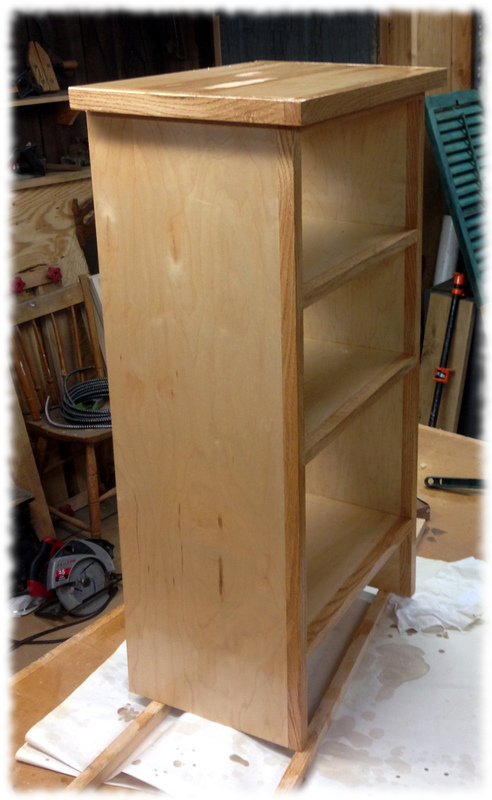 I finished the shelves with a coat of shellac followed by a coat of spar varnish. I’ll probably be lazy and only apply one coat of varnish to the shelves (unless they look like crap tomorrow after the varnish dries). I’ll post pictures of the boxes when I get them done. I have one box (sides, top and bottom) glued up. Tomorrow I’ll sand the interior and put in the shelf. I need to mill more red oak for the face frame and door edging. And when I’m done with the boxes, I’ll need to get back to finishing the dinghy build. At least the barn swallows are enjoying the half-finished dinghy in the garage as a place to hang out.